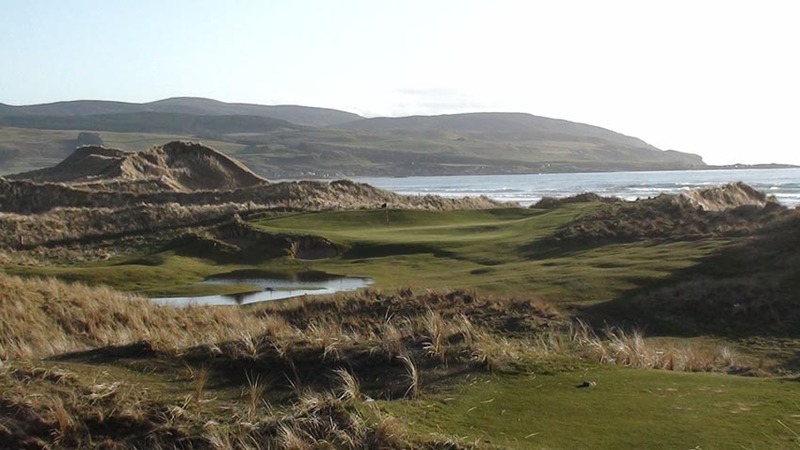 Machrihanish Golf Club in Scotland, near atmospheric Campbeltown at the tip of the remote Kintyre Peninsula, conjures up one indelible image. 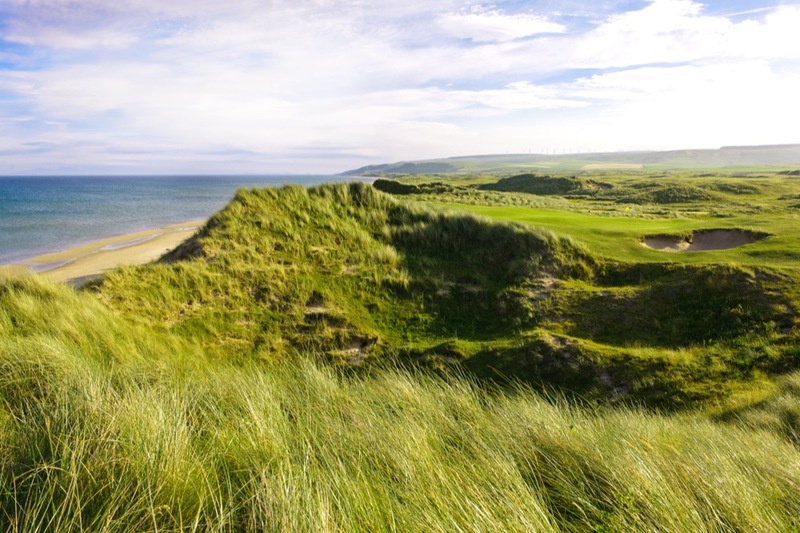 Of all the world’s great golf courses, only one demands that you cut over a corner of the Atlantic Ocean on your opening tee shot, with the beach beckoning down below, surely the most thrilling opening drive in golf! 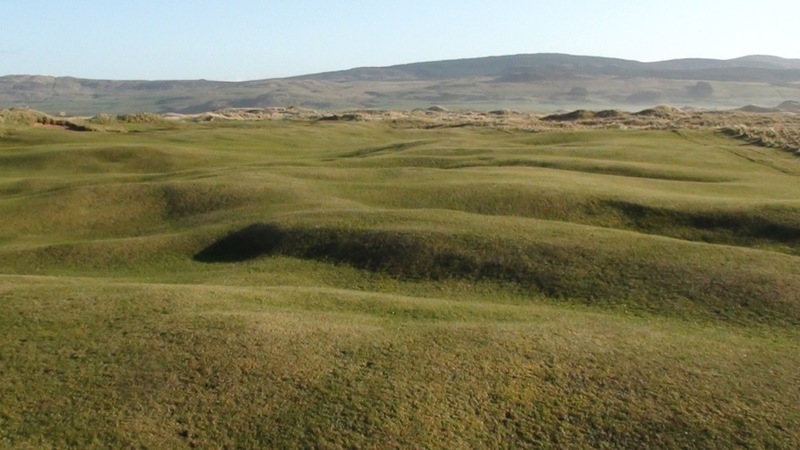 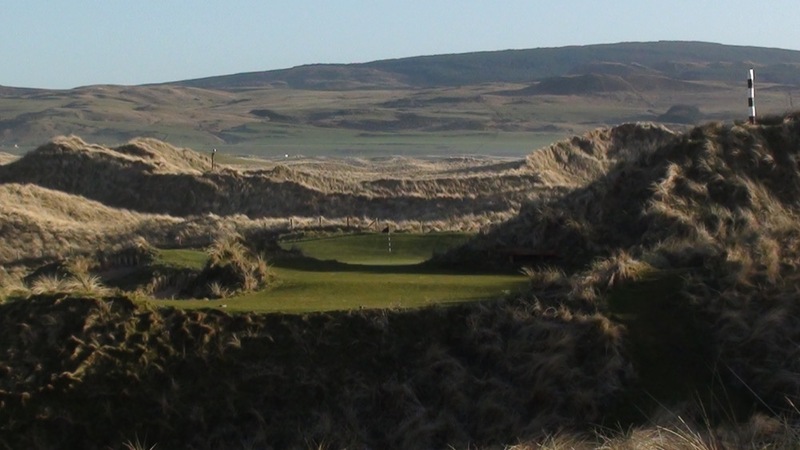 This is right here at the Machrihanish Golf Club, which also happens to be perhaps the last, great, truly undiscovered championship course in Scotland. 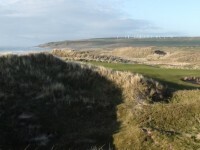 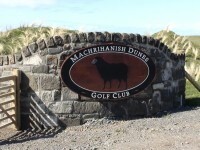 Machrihanish Golf Club is located near what’s called the “Mull” of Kintyre, the actual tip of Scotland’s “mainland island” of Kintyre, which is often confused with the Scottish islands of Islay and Arran but actually attached to mainland Scotland, and Machrihanish is in fact only a mere 3 hour or so drive from Glasgow Airport. 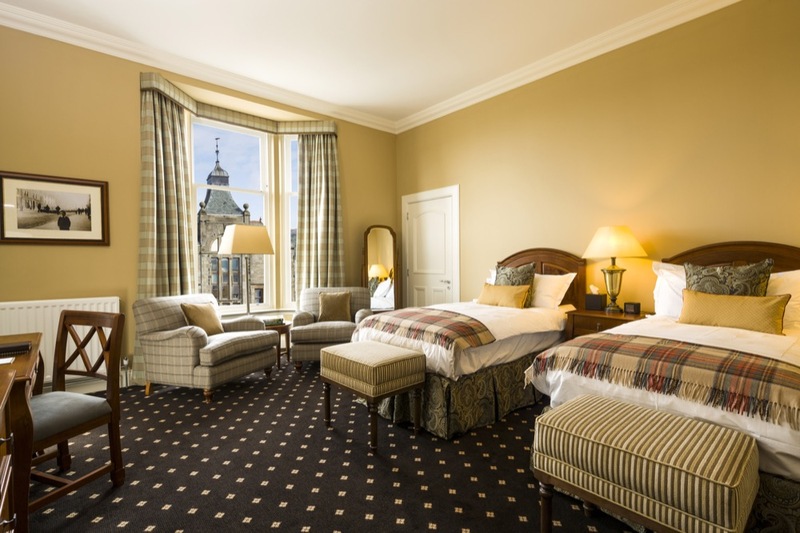 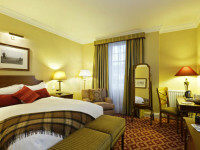 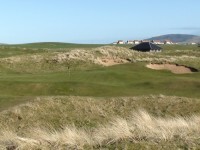 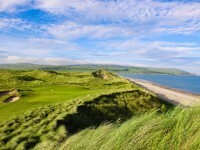 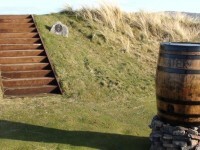 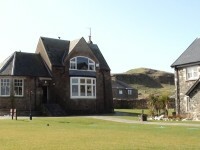 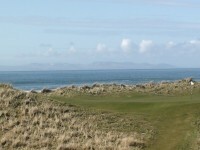 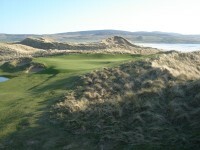 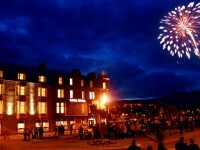 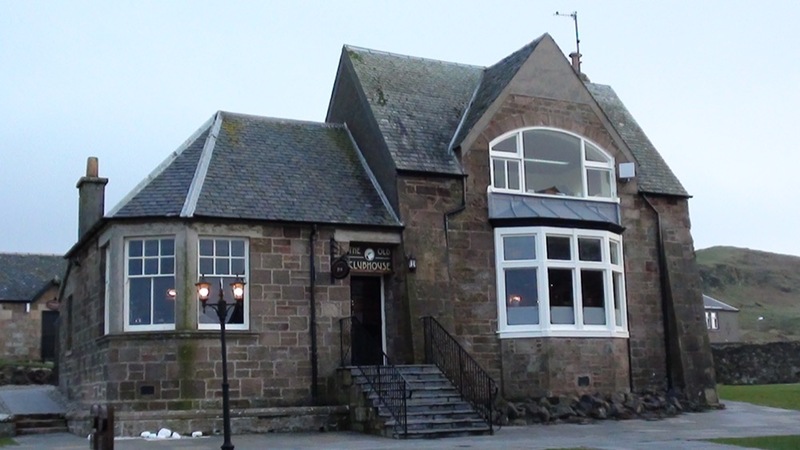 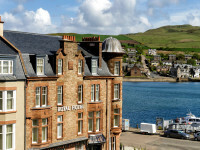 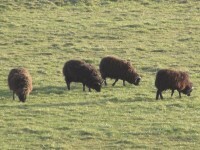 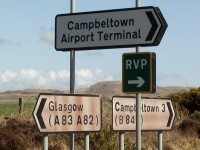 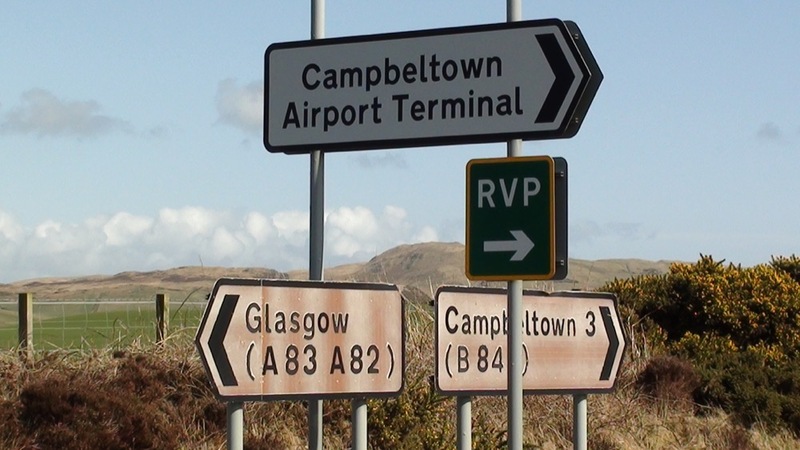 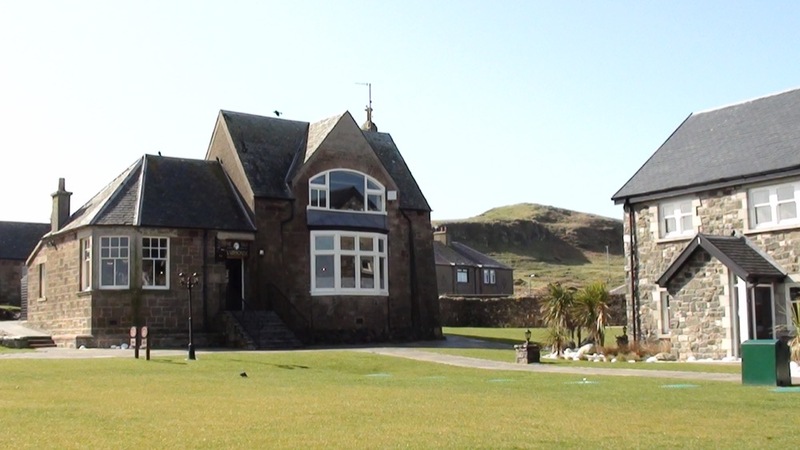 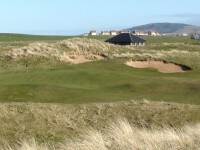 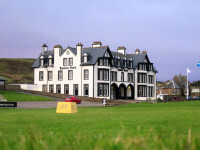 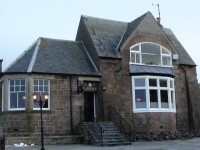 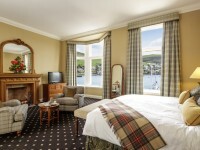 You can fly there from Glasgow very conveniently as well, as Campbeltown Airport borders the golf course. 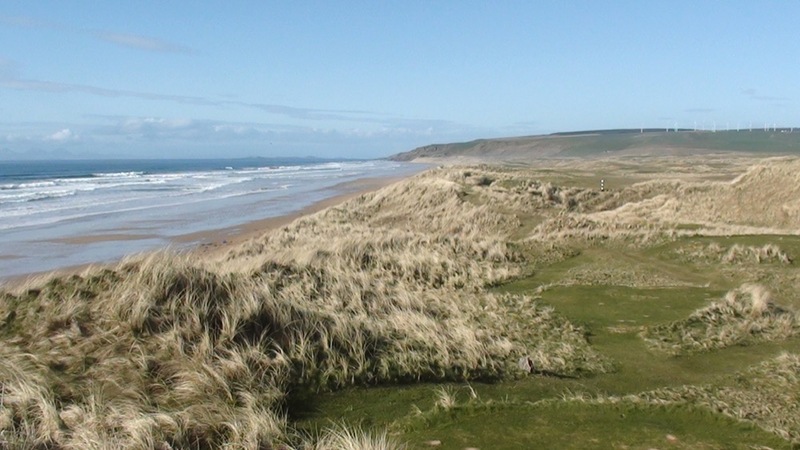 The beach is entirely in play on the first hole at Machrihanish Golf Club, and if you hit it down there, prepare to visit the many locals fishing, walking their dogs, swimming, etc., because your ball is still in bounds! 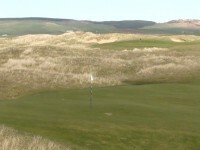 And if you bail out to the right, well, in the wrong sort of wind you might end up almost as far from the hole for your second shot as you were when actually on the tee! 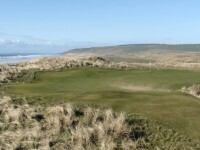 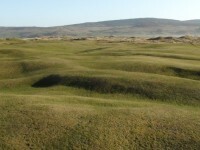 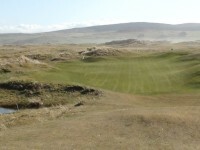 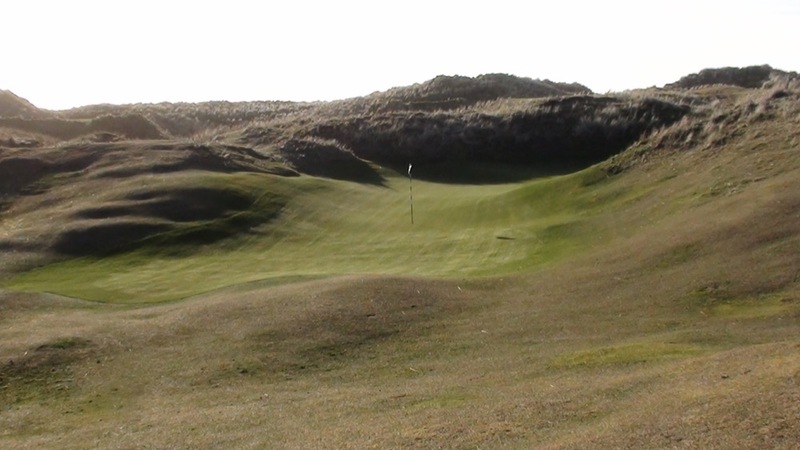 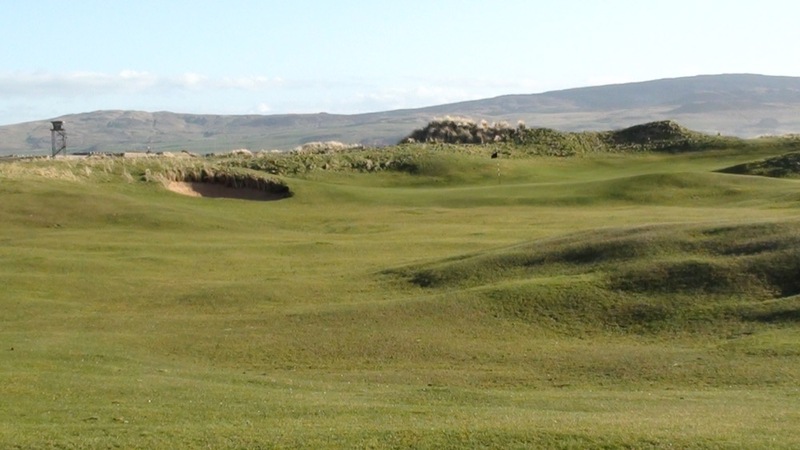 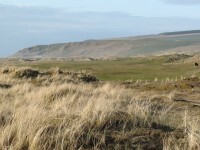 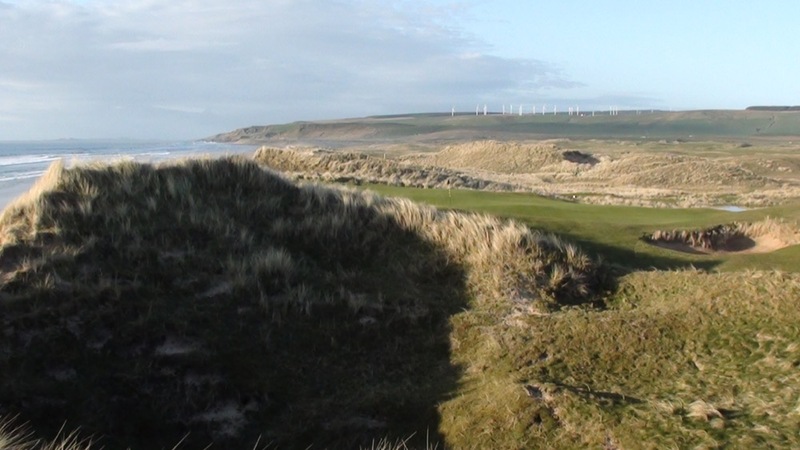 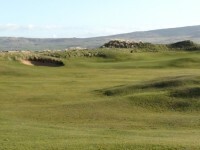 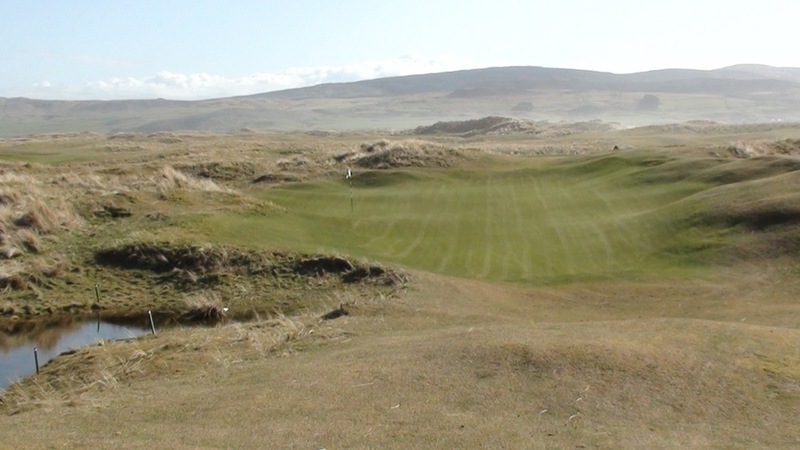 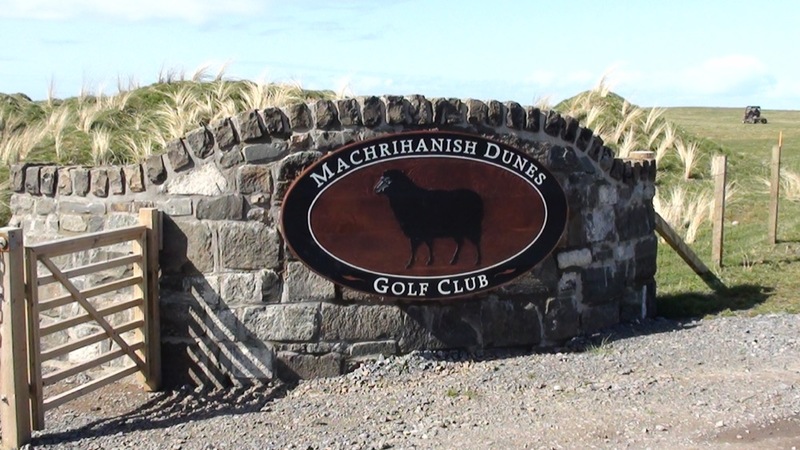 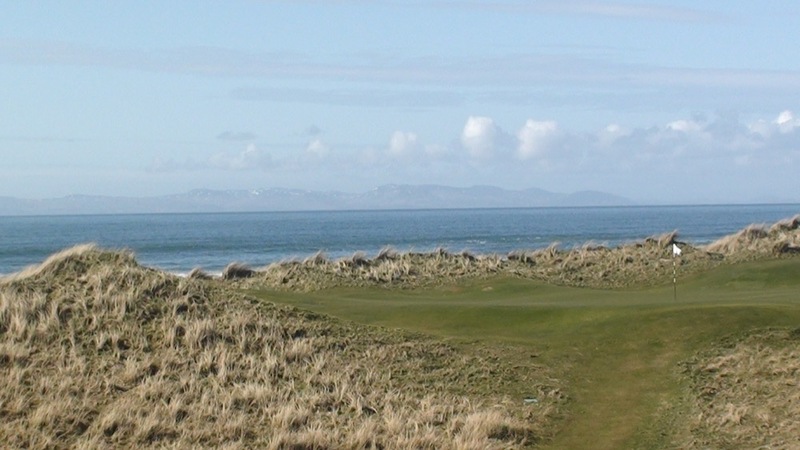 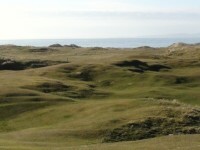 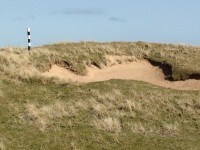 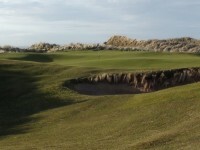 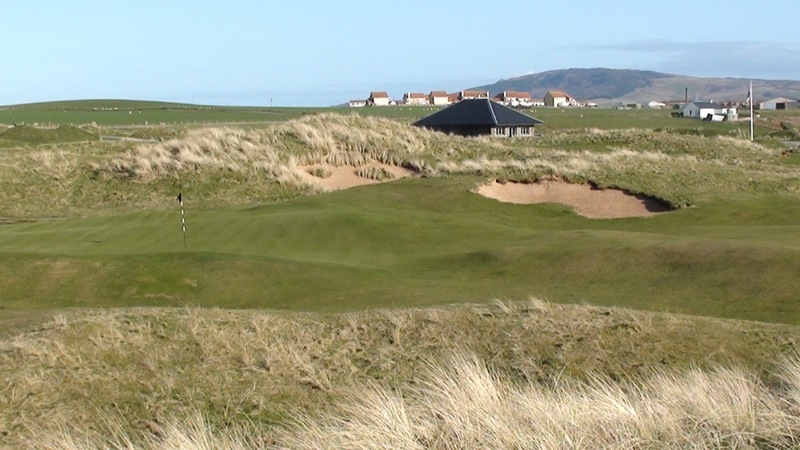 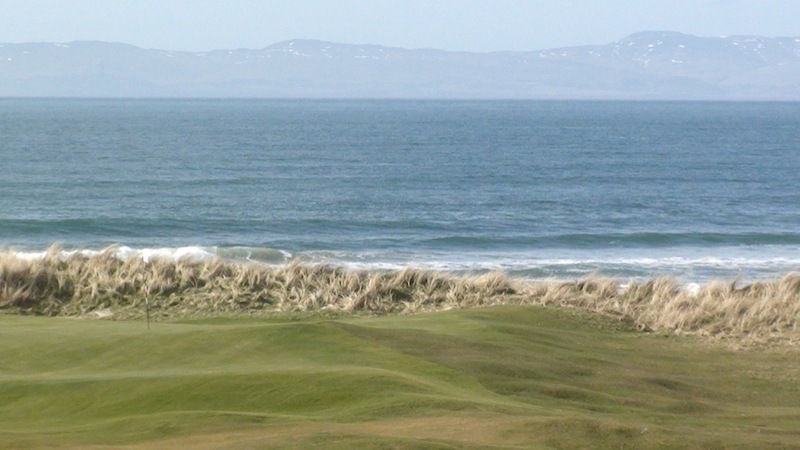 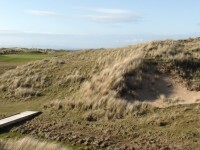 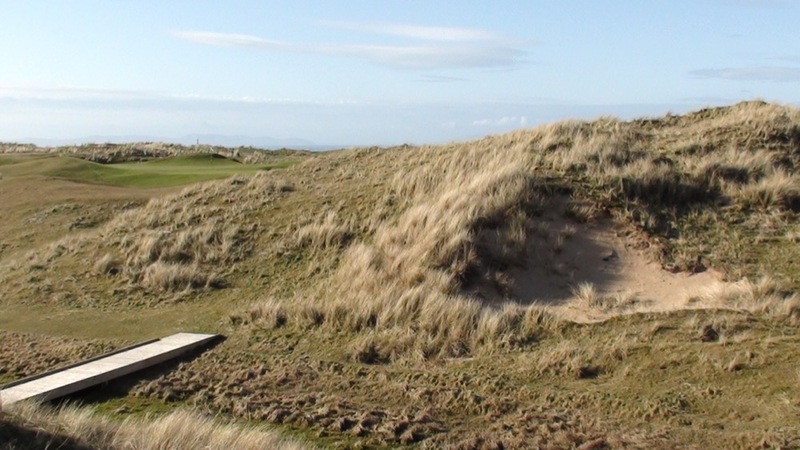 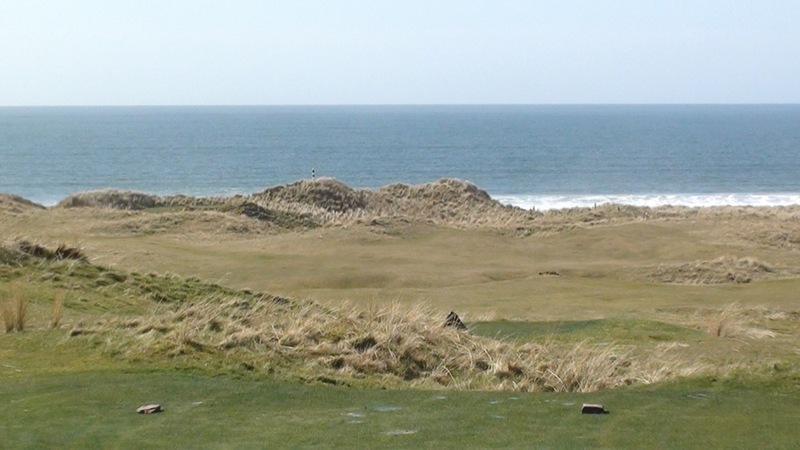 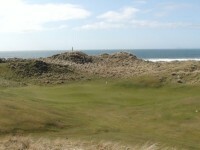 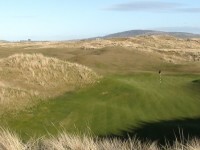 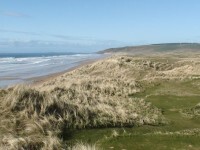 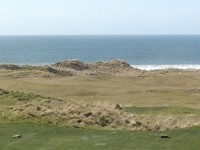 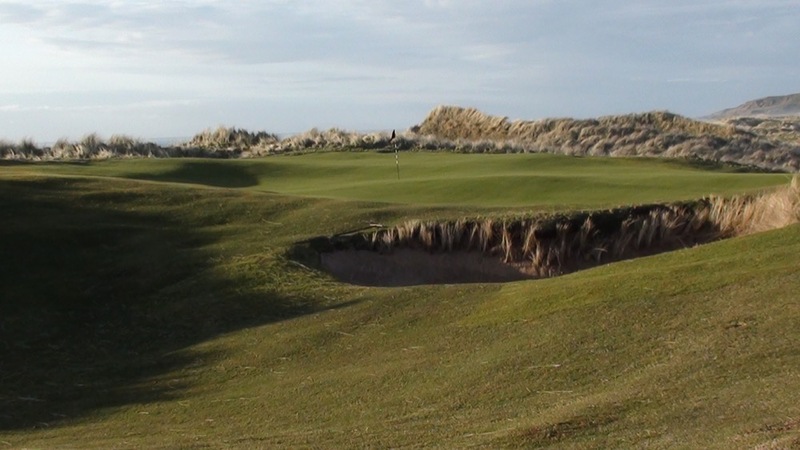 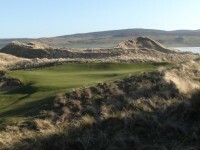 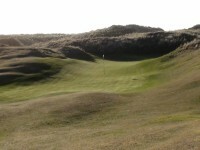 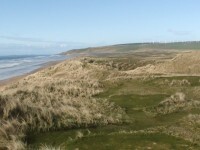 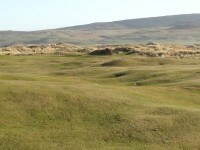 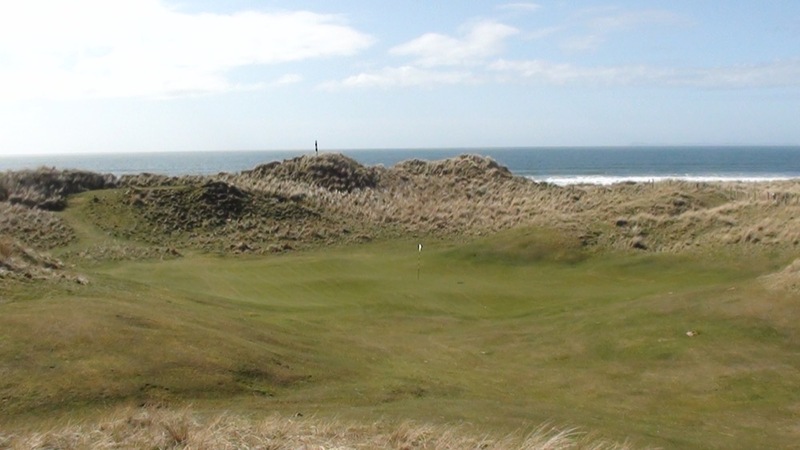 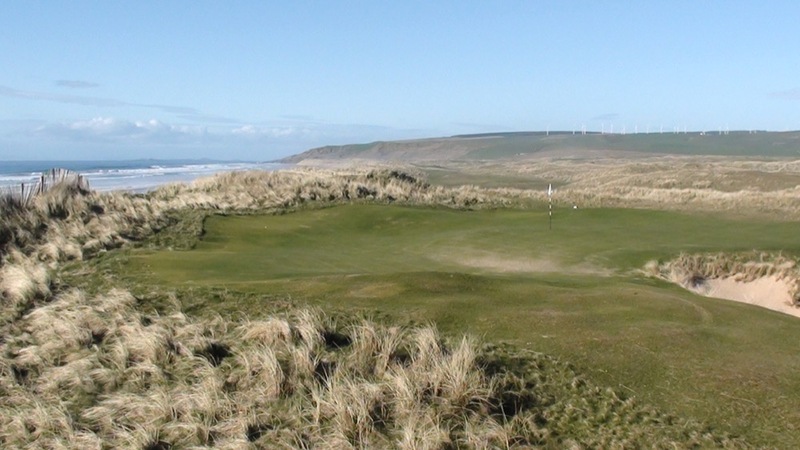 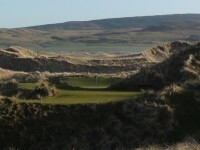 The rest of the course at Machrihanish Golf Club is no letdown whatsoever, as Machrihanish is a traditional out-and-back links that finds ways to change directions bringing the different winds into play, full of appealing undulations, with some beguiling blind shots as well. 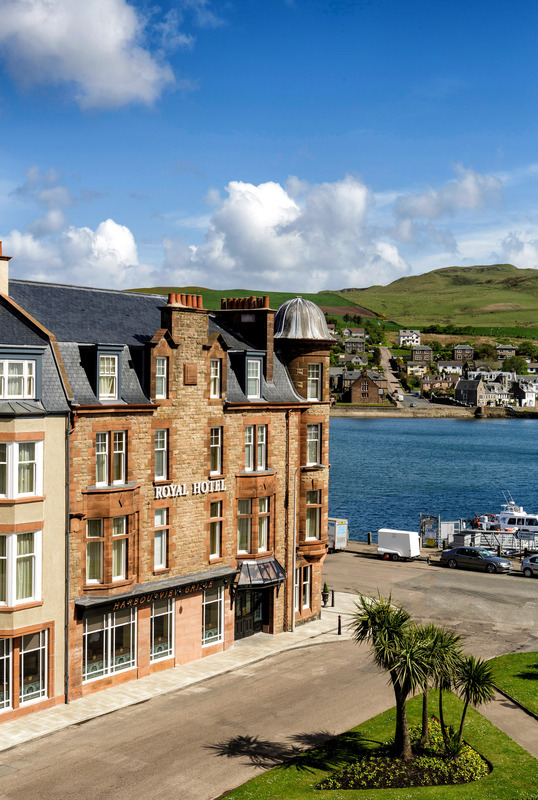 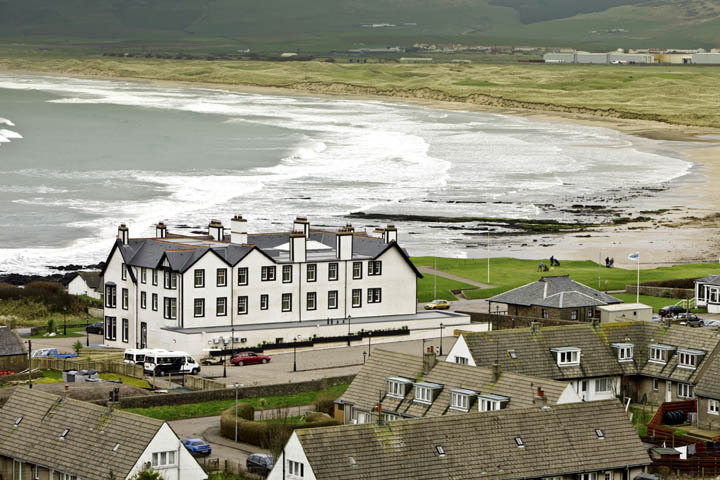 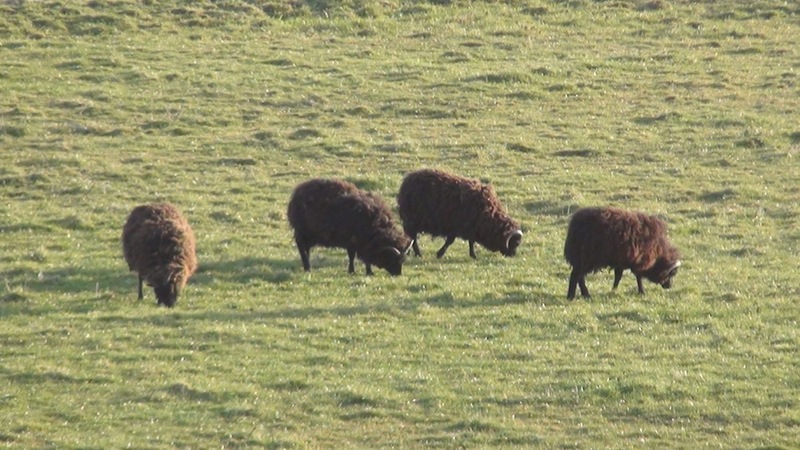 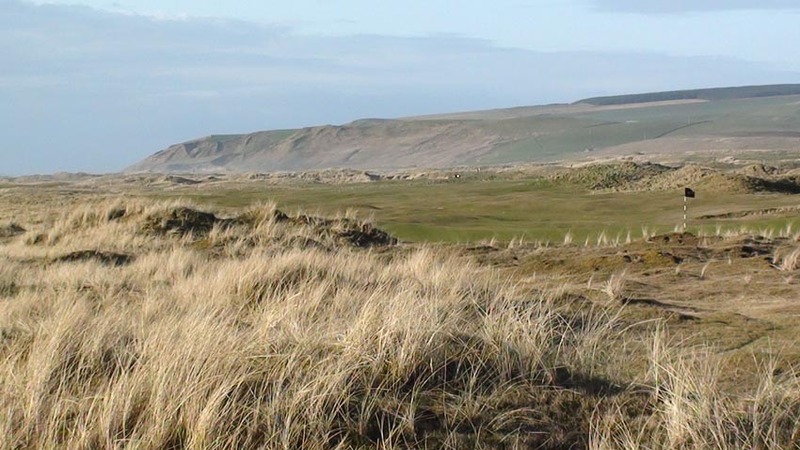 The views of the Machrihanish town, the coastline, and the distant hills on the way back in are some of our favorites in Scotland. 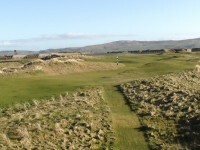 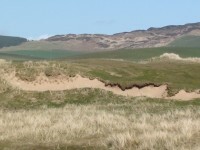 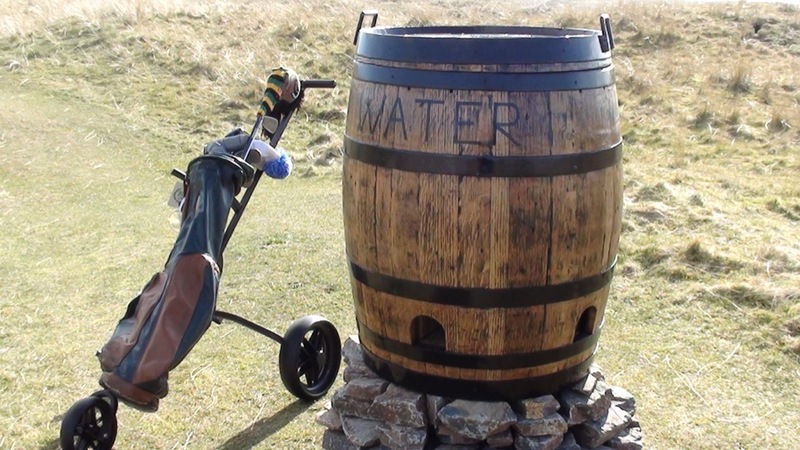 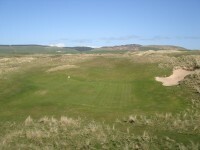 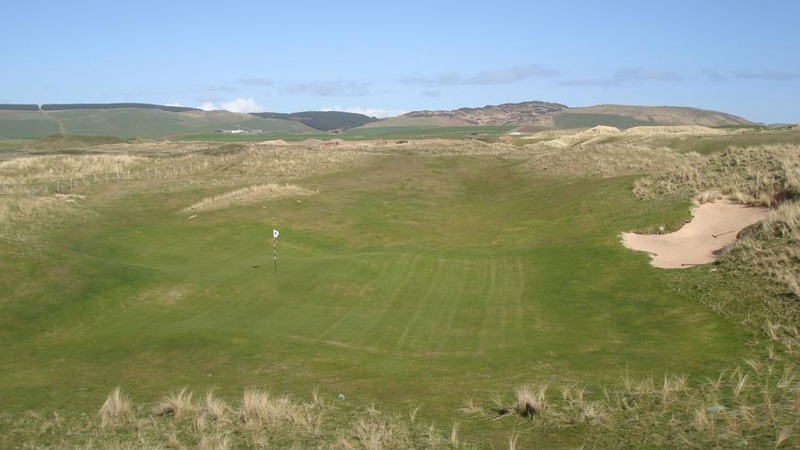 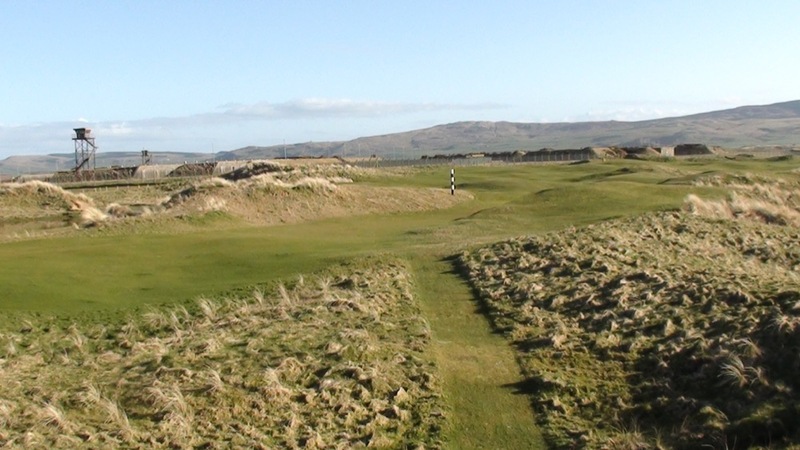 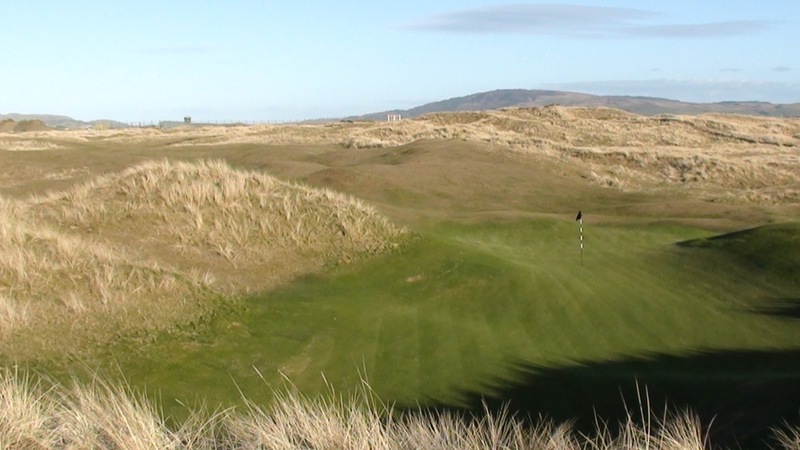 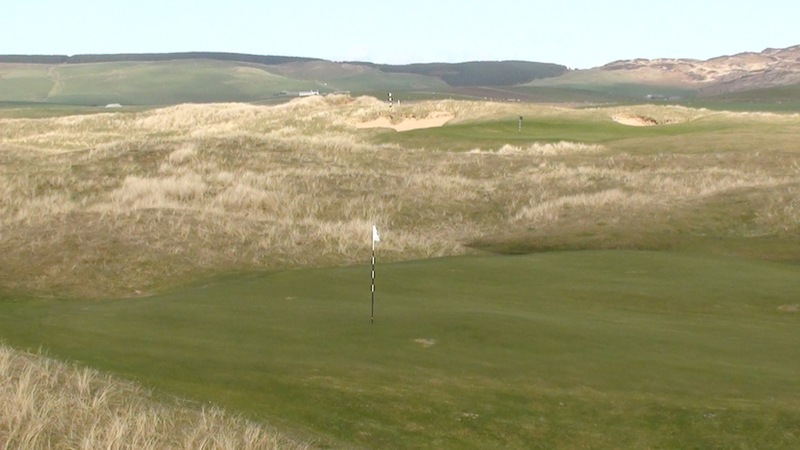 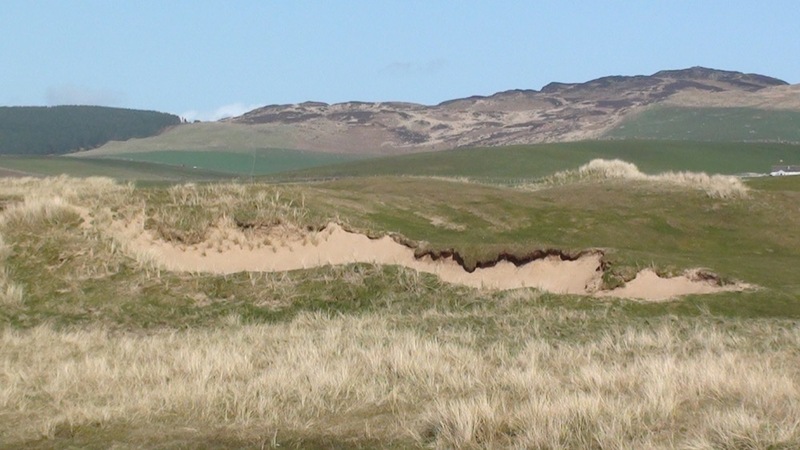 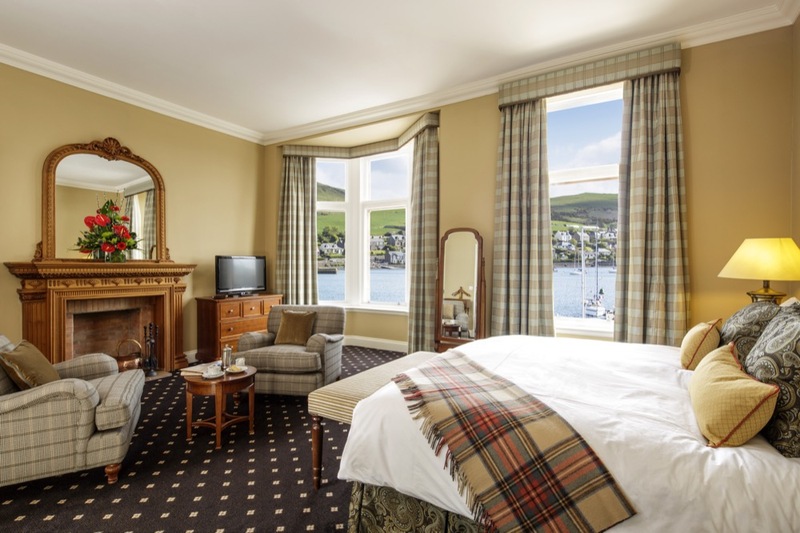 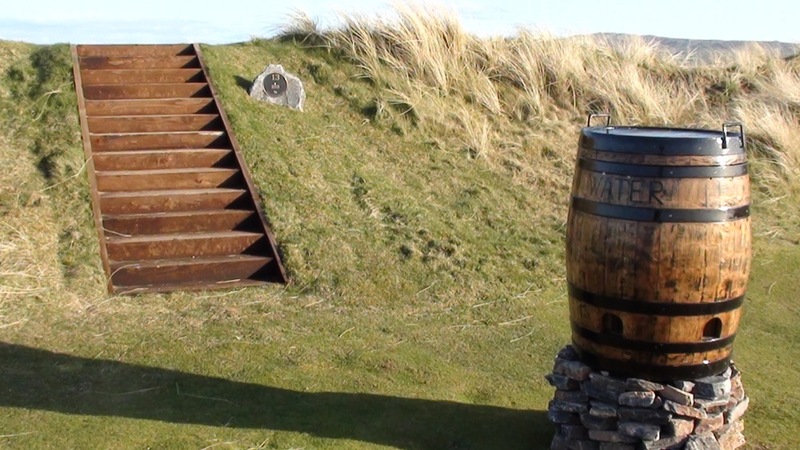 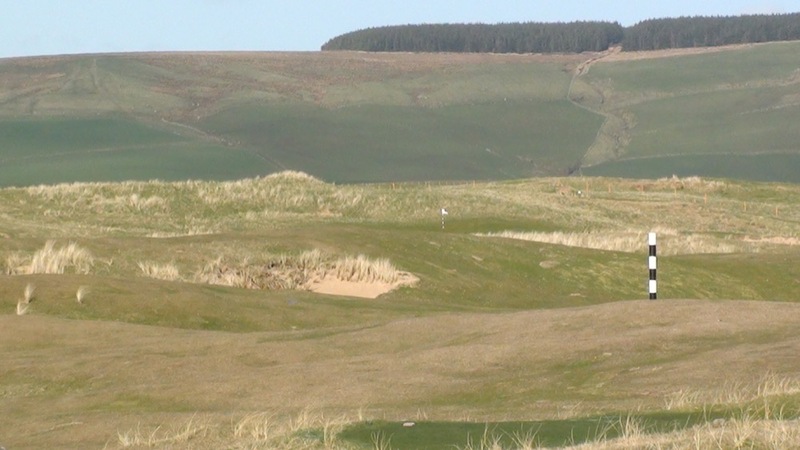 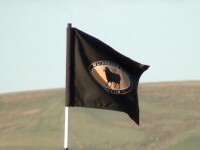 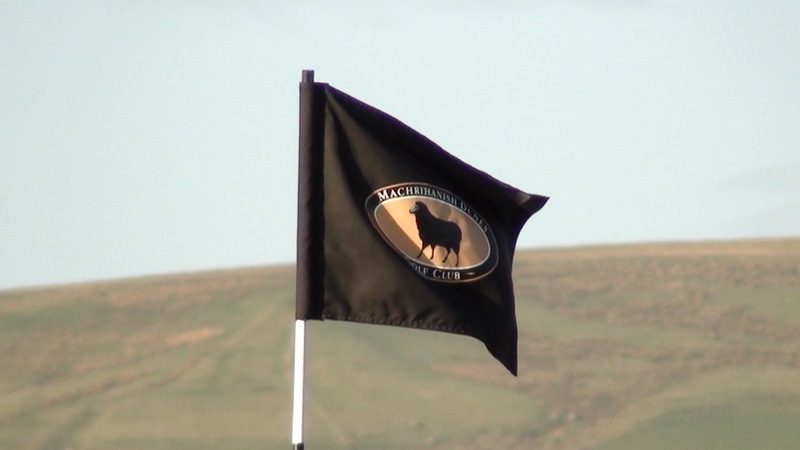 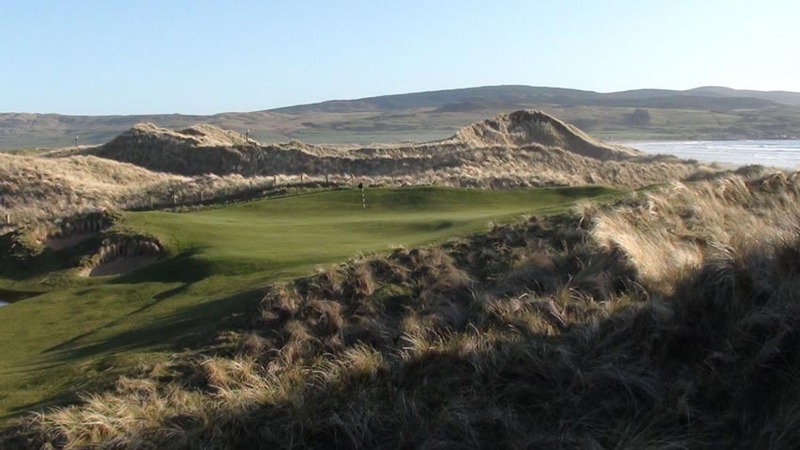 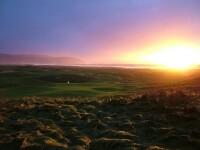 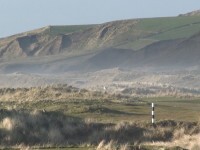 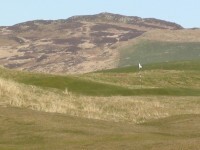 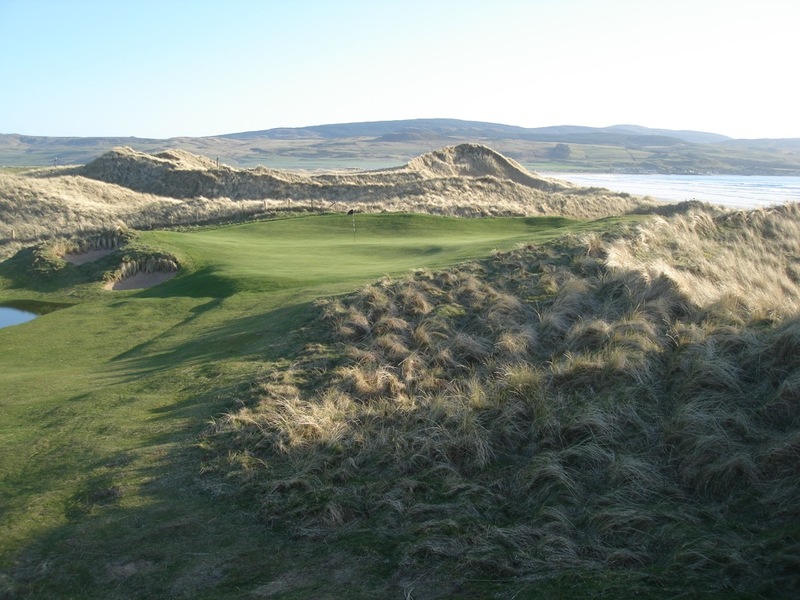 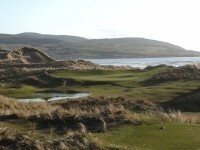 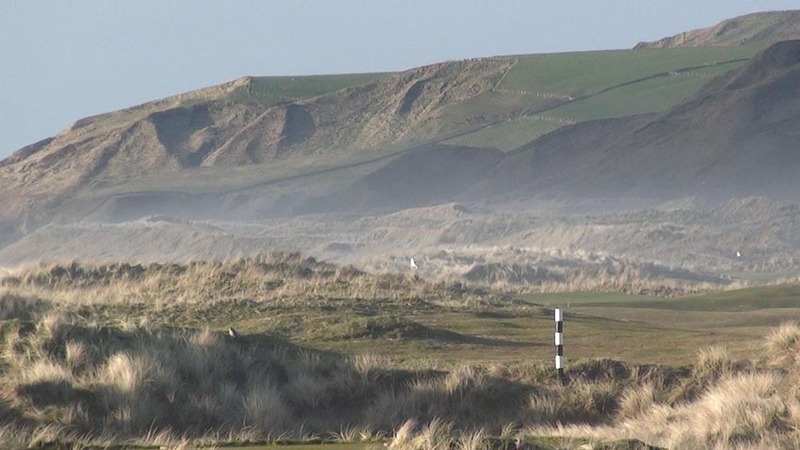 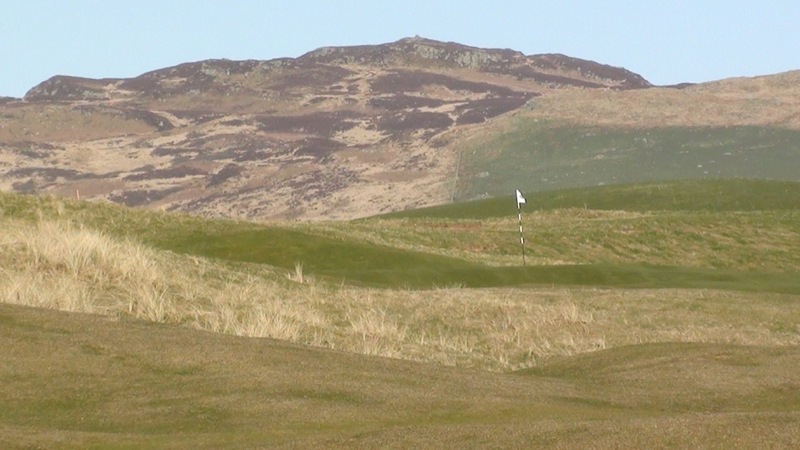 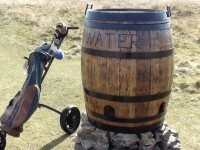 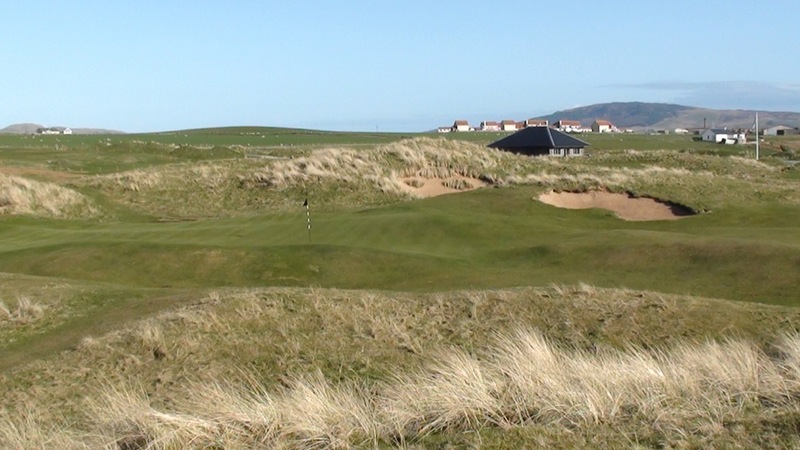 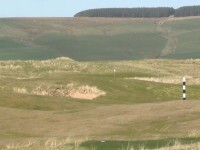 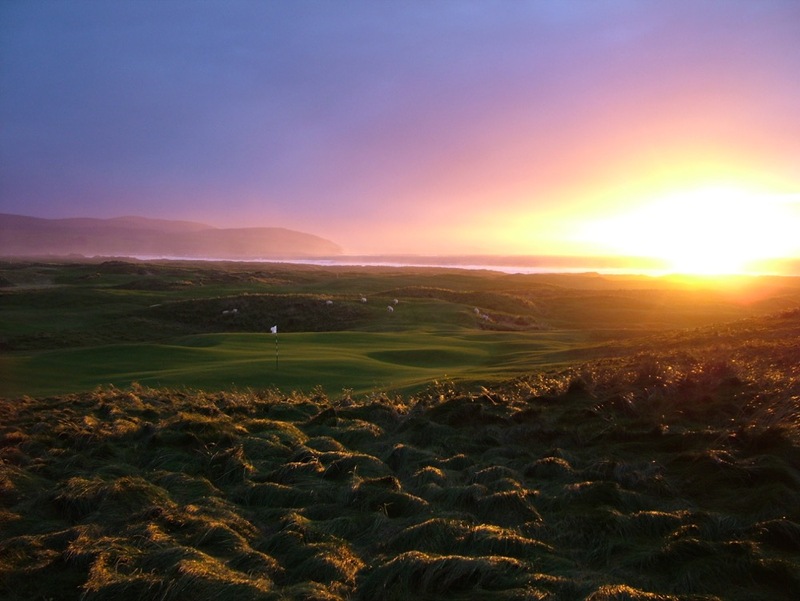 But even without the great links course, the beautiful setting, the wonderful remoteness, the charm of Campbeltown, if all there was at Machrihanish Golf Club was just that exhilarating first tee, you should still cross oceans to play it! 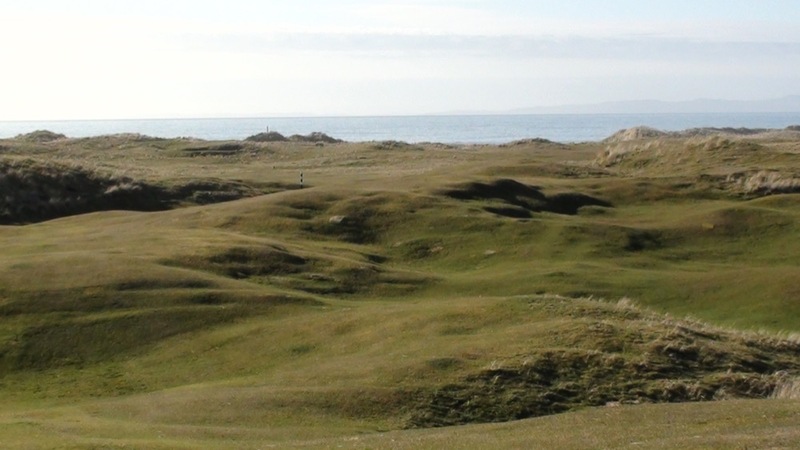 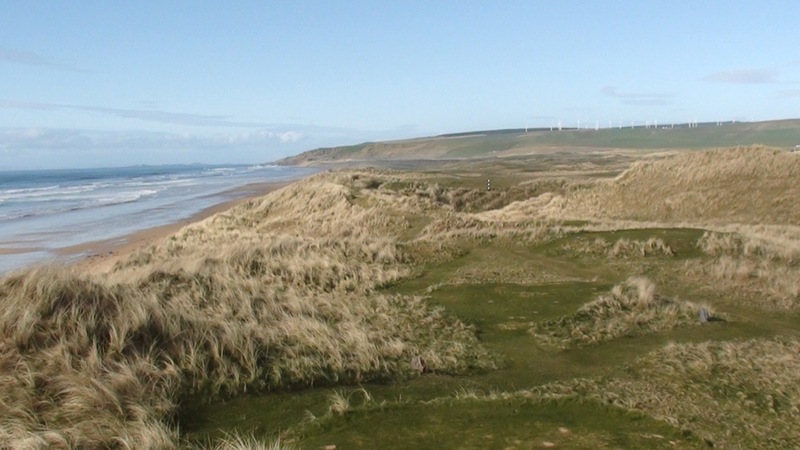 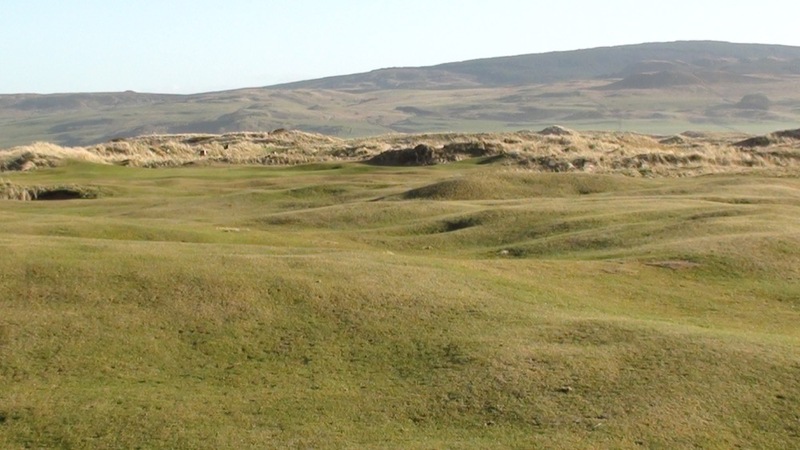 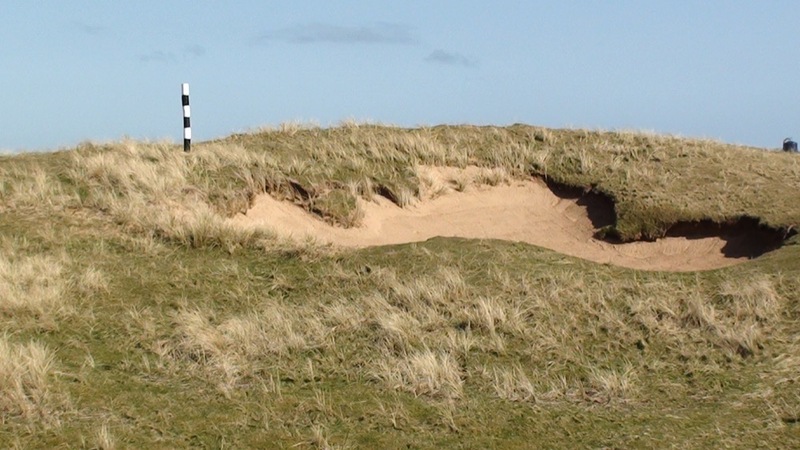 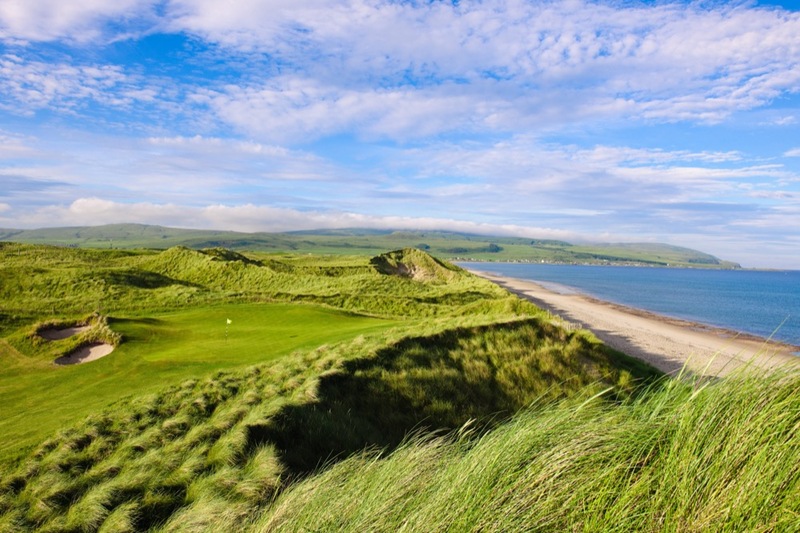 Machrihanish Golf Club in Scotland may have been romanticized just a bit but not many have actually made the effort to play it. 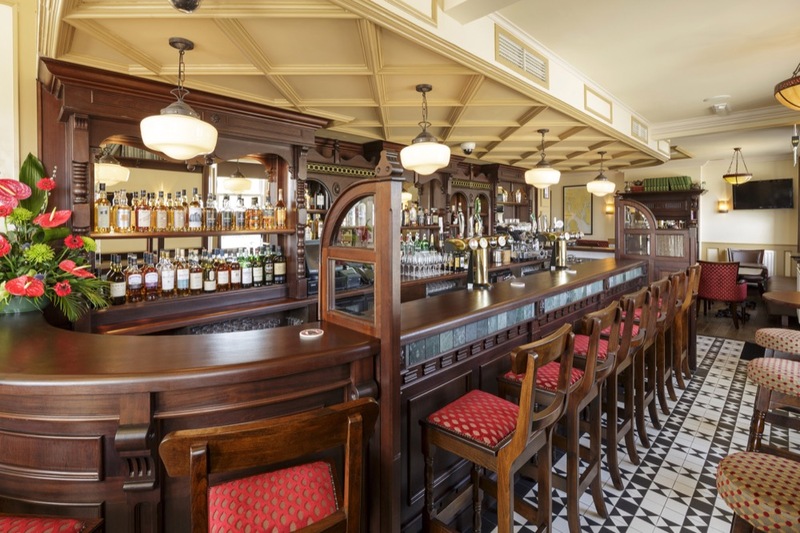 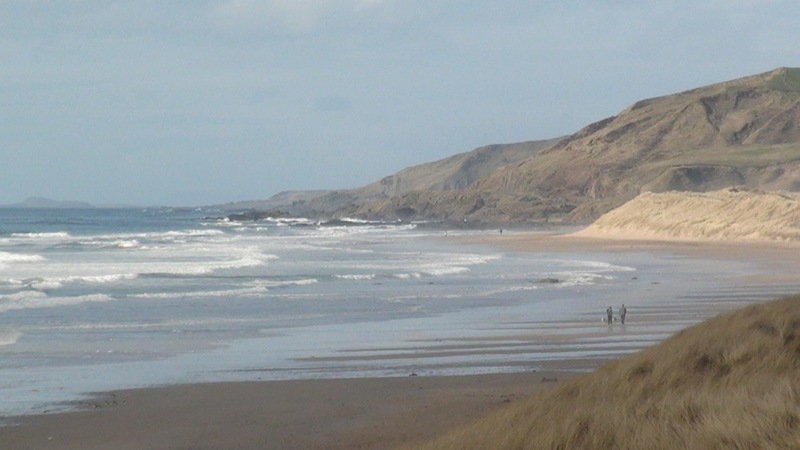 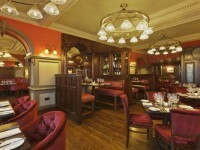 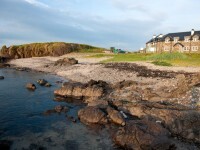 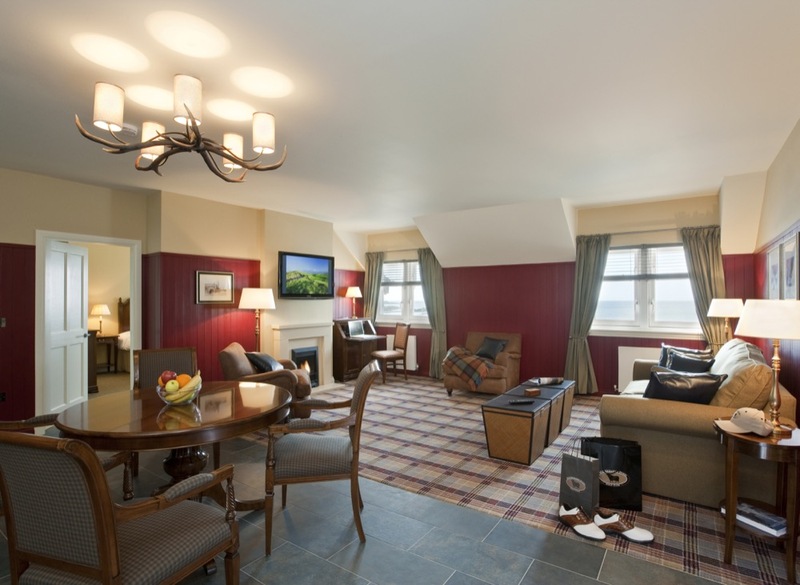 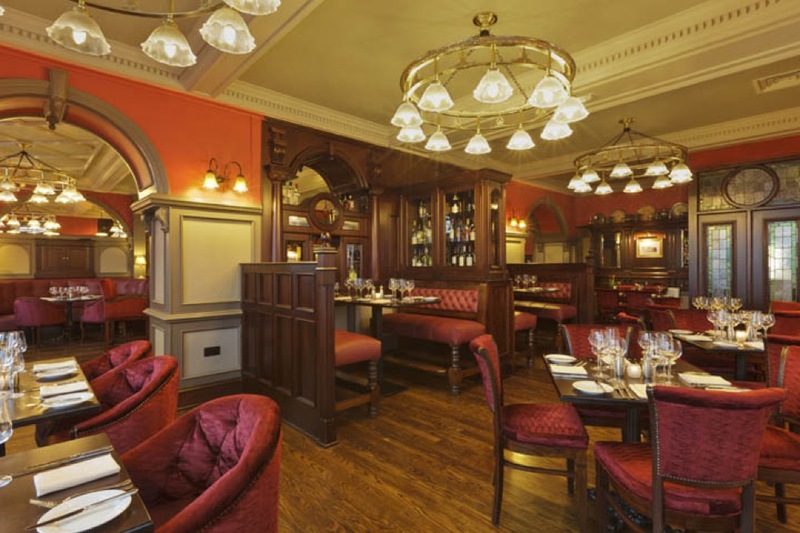 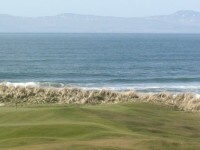 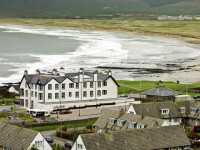 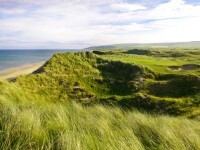 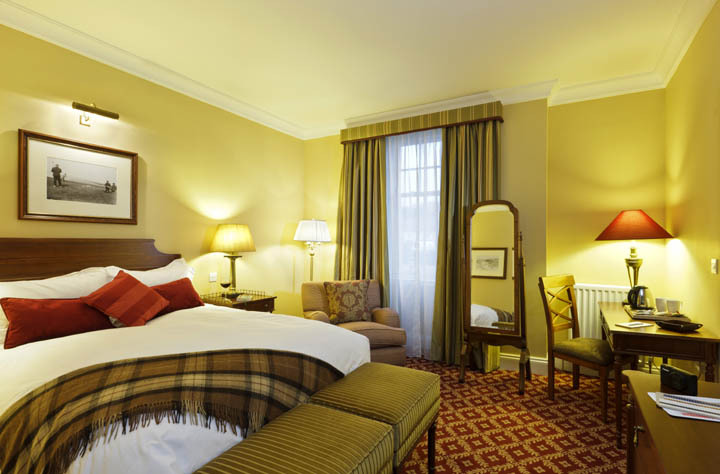 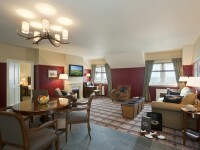 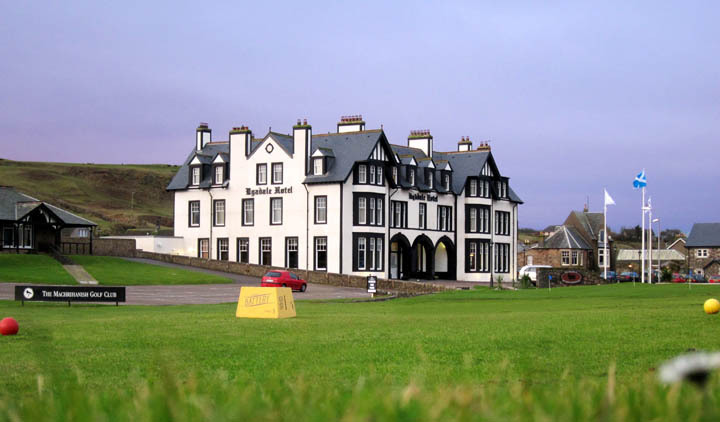 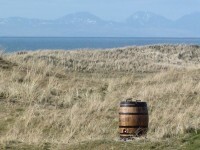 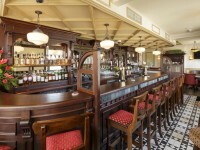 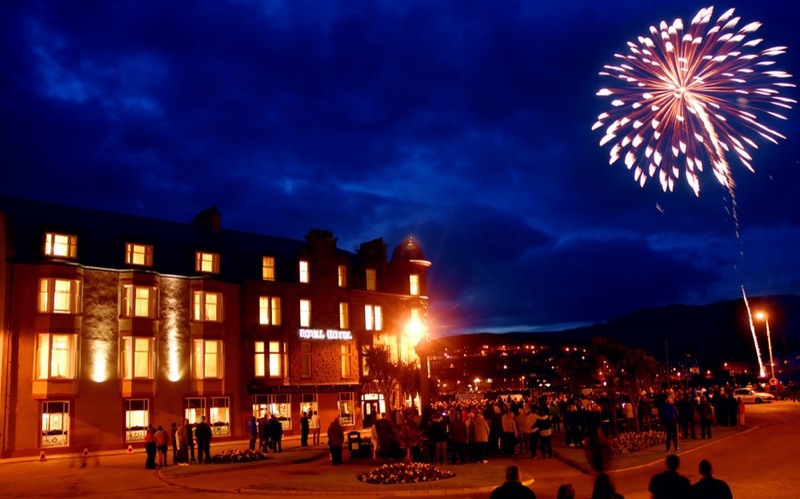 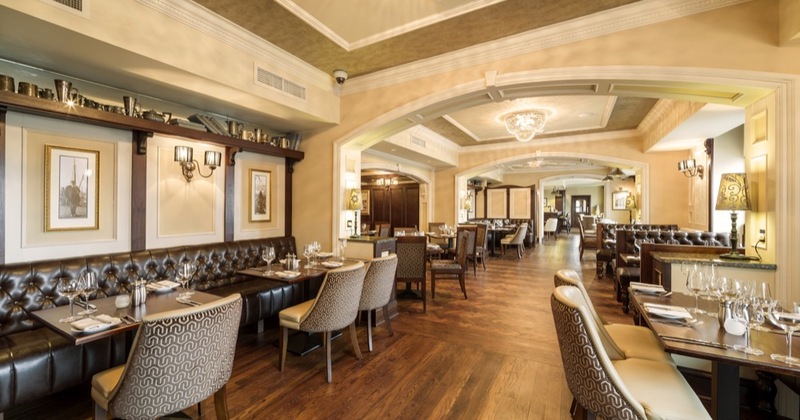 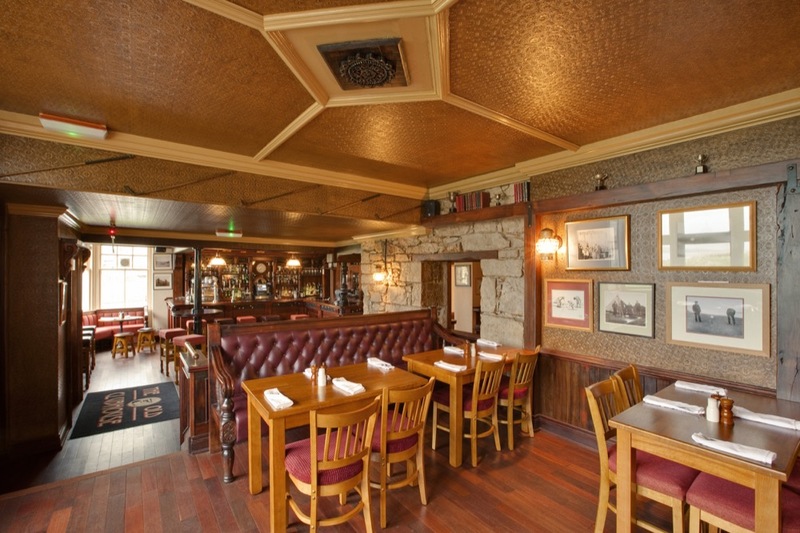 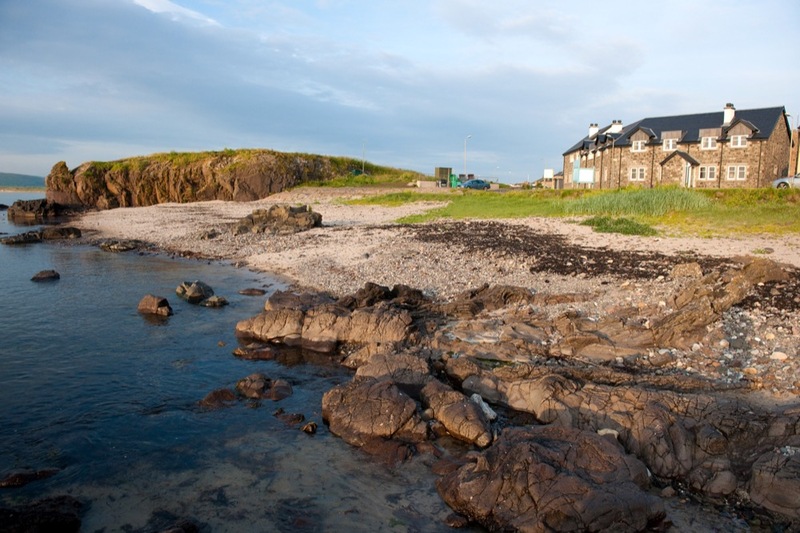 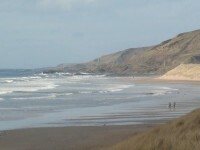 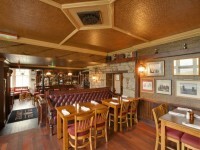 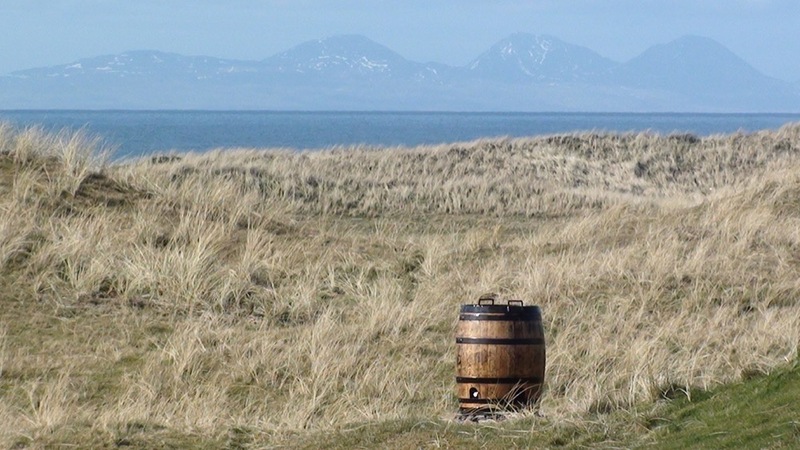 We encourage you to find Machrihanish before everyone else does!